As a young person growing up in the pet-fish industry, I became familiar with the comical aspects of the common members of this family (the intelligent behavior, novel feeding habits...) as well as the not-so funny parts of their husbandry (whole imported shipments that would die "wholesale")... As a fisheries biology college student I ran into this group from another angle. On reading about the at time world's largest artificial lake (Kariba, formed between Zimbabwe and Zambia on the Zambezi River... back in the nineteen fifties)... I ran across "Mormyrops deliciosus"... yes a Mormyrid food fish. It turns out, one of many. Mormyrids are known for a few notable structural and physiological characteristics. They owe their apparent "stiffness" of body to their development, use of electrogenic sense. These fishes produce dipole moments, magnetic fields and can sense perturbations in the same. Even modulate the fields as a means of communication. How many other families of fishes can you name that are electrogenic? There are several, as you will see. Harkening back to the reference to massive losses at the wholesale and retail levels of these fishes, let me assure you that hobbyist losses are indeed preventable. In fact, most people who lose Elephantnoses do so through some very simple mistakes... allowing space for them to "jump out", haplessly treating them with caustic "fish medicines", starving them (for wont of live, meaty foods or too much tankmate competition), not granting them enough "dark space"... If you secure initially healthy specimens and meet their simple needs, you will find the mormyrids to be far from "sensitive" fishes to keep. All mormyrids are confined to the African continent, from the Nile in the north to the Lake Victoria in the east, and all freshwater. There are some very large mormyrids, up to five feet in length (i.e. the delicious one mentioned above). Most species (18 genera, 198 species), are more like a foot long... with the smallest at just under three inches (7 cm.) as an adult (Petrocephalus catostomus). 1) Wait on new arrivals. At least a week, two better, should go by before moving them again... Unlike terrestrial animals, fishes don't show signs of duress or outright dying till sometimes such time frames have gone by. When in doubt, wait. 2) Look for over signs of damage. Torn fins are no problem, but bloody marks on any specimen in a shipment, particularly in the same system, should terminate your choosing them (at least at that time). 3) Ask to see the fish/es feeding. Many are collected with local toxic materials (yes, unfortunately so) and most that are overly toxified will not accept foods subsequently. Ask for the feeding test. Not feeding? Leave them. 4) Related to feeding, apparent "index of fitness" or fullness of body is important. Very often these fishes have had little to nothing to eat for weeks in the process of capture in the wild through holding, shipping to the "end-user". Skinny specimens should be held and "bulked up" for a few weeks before being sold by retailers. 5) Behavior. Look, select "winners". On observing these fishes for even a short while, you will notice the ones that are more outgoing, if in a group, "bossing" the others around. Typically, larger individuals are stronger, in better condition, much more likely to adapt, live in captive conditions. Looking at a typical Mormyrid reveals a body of narrow width, lateral compression... color, dark mud-brown to blackish (perhaps with a colorful sheen)... 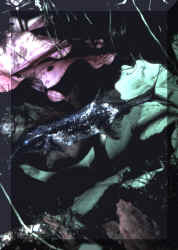 These fishes live near the bottom in muddy settings and among densely planted regions. You can replicate these qualities in your setting for them. Diminished light, plenty of cover/decor, and live plantings. There are many true aquatic plants that do well in low light conditions, and they in turn will do a tremendous lot in modifying, improving and stabilizing your water quality. Can be composed of sand or rounded gravels. Take care to avoid types that are angular/sharp, as your Noses spend most of their time near the bottom, rooting around for foods. Similarly, don't place sharp rock, other aquascaping elements that these fishes can damage their delicate bodies on. Natural woods of different sorts are excellent. 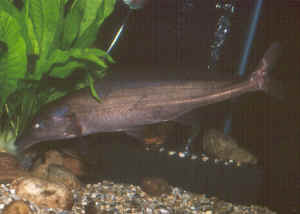 Mormyrids are tropical fishes that enjoy warm, consistent waters. Upper seventies to low eighties Fahrenheit are ideal. In their environments, neutral to slightly acidic pH's prevail of low to medium hardness. In aquariums, they've proven hardy toward a wide range of chemical conditions. A note re water treatment for their use: do treat all such water, and ideally store it for a week or so ahead of use. Mormyrids are quite sensitive to the biocides used in disinfecting mains/tapwater. Metal problems, and I'm not referring to heavy music here. Metal of any sort, particularly ferrous (iron, steels) is problematic in these fishes environments. Avoid metal thermometers, any metal inclusion in their systems. Running a magnet through the substrate in place or ahead of use is a good idea to detect, remove ferrous contaminants. We've mentioned these fishes' penchant for jumping, dislike of bright lighting, need for cover/caves... Many, too many, end up as "carpet jerky" from a lack of consideration of these requirements. Wholesalers: keep piping, roots in with these fishes, low light, lowered water level... with covers over them! Mormyrids of the size, species used/available to the hobbyist are very peaceful animals. They are neither strongly electrogenic, able to stun tankmates, nor interested in eating fishes or easygoing non-fish livestock that won't bother them. This being stated, there can be definite troubles in mixing members of the same species or other mormyrids together. Yes, there are few displays as intriguing as a group of "noses" cruising a planted aquarium... have seen quite a few of these in Public Aquariums around the world. But do understand the size of these systems. I am hesitant to mention such, but given sufficient aquarium space, Mormyrid species can be kept in small groups (pairs, trios are worse than larger numbers like four or five) in captivity (many do live in groups in the wild). For the common/available species a good twenty five gallons per individual, plenty of hiding spaces for all must need be provided. In crowded conditions, invariably the larger mormyrids "win" at the expense of their smaller brethrens loss. The short of this monotribe: Mormyrids are almost always best kept as individuals in private aquariums. If you have the room (hundred/s of gallons), study, interest to try more than one per system, fine. In the wild most mormyrids (of the size, type used as aquarium specimens) consume small crustaceans, insect larvae, worms found on/in the substrate, using their labile mouth/jaws and "noses" to find and root out same. In captivity, they should be offered similarly sized (they can't bite) meaty foods near the bottom AROUND NIGHTFALL. Especially at first, you will not likely see your "nose" eating much of anything. Persistence pays in regularly placing foods near where it/they live. Foods need not be live to be accepted. Bloodworms (actually insect larvae), various other frozen/defrosted foods are generally taken with gusto in time. These are largely nocturnal species that "sleep" a good part of the day naturally... but can/do adapt more to daytime activity in aquariums, moving about forward, backward, upside-down with familiarity. Some species have characteristics that allow for sexual determination, but none of the ones available to/in the pet trade. Likewise, there are species whose spawning behaviors are known from observations in the wild. As far as I know there are no confirmed Mormyrid spawnings in captivity. Seasonal reproduction in the wild is tied with the rainy seasons, with low pH, humus-rich waters rising, spawners ascend into smaller tributaries... For some species parental care has been speculated... tied in with these fishes low fecundity. At a few times the capacity (pun intended) for fishes to produce, use electric current has arisen. Some families, species are strongly electrogenic, utilizing specialized tissues to produce current, amperage of magnitude to procure food and avoid predation by "shock". Some other groups are "weakly electrogenic" including the Mormyrids (and many "knife fish" of South America, others...). Elephantnoses have muscle tissue in the near tail portions of their bodies that through selective "leaking" and storing of charged particles can/do produce a magnetic/electric field about them. All living tissues contain ions, charged particles... the movement of (or movement about these) organisms can be sensed by these electrogenic fishes as perturbations in their relatively static (the reason for their apparent head to tail "stiffness") fields. What's more, they can/do use the modulation of these fields for communication... identifying other individuals, mates this way. A fascinating aspect of these fishes. How smart are we? Our brains (that use some twenty percent of the oxygen we "consume") make up some 2.3 percent of our body weight, are nice enough to tell us we're tops! Well, move over... the commonest Elephantnose, Gnathonemus petersii has a larger percentage by weight (3.1) that takes up much more of its carriers oxygen intake (some sixty percent)... Wonder who Elephantfishes think are the smartest animals? As previously hinted, mormyrids are intolerant of what passes as "fish medicines". Copper, formalin, dyes, salts are often deadly toxic to them. Unfortunately the group is susceptible to the typical external parasites of pet-fishes like ich. What to do? Prevention, good handling, maintenance practices are best. Elevated temperature is often efficacious. I can see some of you shaking your heads on reading this brief coverage of the Mormyridae and their "use" in captive systems. "He says that these species aren't difficult to keep, then gives a litany of their needs, challenges...". Assuredly, once acclimated, given just the simple advantages tallied above, you will be rewarded with long-lived intelligent aquatic pets in the Elephantnoses.